Reader Dan loves his Asus netbook--but not its clock. Every time he turns the machine off, it seems to lose a couple hours. But the minutes, he notes, remain accurate. There are a number of reasons a computer can fail to keep good time. It could be the result of Windows failing to connect to its time-sync server, or it could be a dead CMOS battery. In this case, however, it's something much simpler: Dan's netbook is set to the wrong time zone. Readjusting the clock fixes the problem for his current session, but every time he reboots, the clock automatically readjusts itself based on the time zone setting. 1. Right-click the clock in the System Tray (bottom-right corner) and click Adjust date/time. 2. 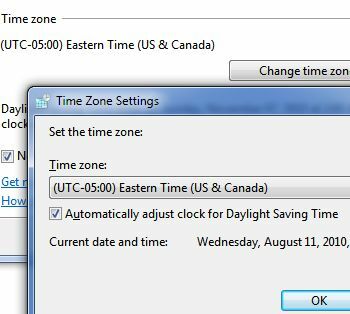 In the Date and Time box that appears, click Change time zone. Choose the proper time zone for your location. 3. Click OK, then click OK again. That should do the trick, Dan!